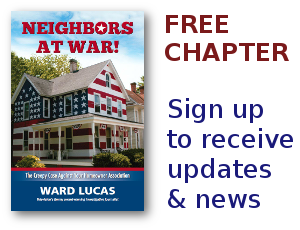 Home Assoc Archives - Neighbors at War! 3 Comments on Victories Are Rare! It’s not often when a beleaguered homeowner gets a chance to beat up a bullying Homeowners Association, but I do love to see it happen. Mommy and Daddy Are Going To Jail! 9 Comments on Mommy and Daddy Are Going To Jail! Excuse my language, but WHAT THE HELL is going on at Raintree Lake in Lee’s Summit, Missouri? This family project of building a playset is about to land the parents in JAIL. All because the stain they used on the wood is purple. And since when do HOAs have the legal right to put somebody in JAIL? Isn’t JAIL where criminals go? Tell me what is criminal about purple? Or a playset. Oh! That’s right we’re dealing with an HOA here. Now, this all makes sense. Our frequent guest blogger, Deborah Goonan, alerted me to an excellent documentary which could ultimately go straight to the heart of the fight against the HOA disease. It’s produced by the Annenberg Foundation and reviews two of the most important U.S. Supreme Court decisions of the 20th Century, Baker v. Carr and Reynolds v. Simms, which were both decided in the early 60s. This one has been circulating recently. It involves a tiger, a police stop, and a Washington State kid who’s already wise to the ways of his Homeowners Association.